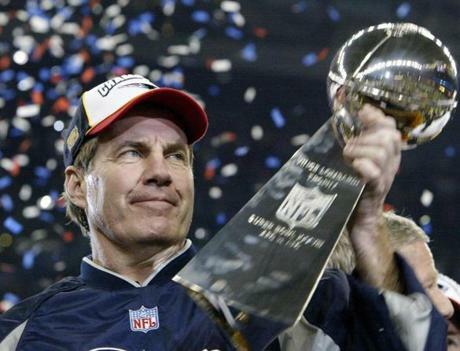 Patriots coach Bill Belichick hoisted the Lombardi Trophy for the second time after shepherding his team to another title, this time in a wild, back-and-forth contest. 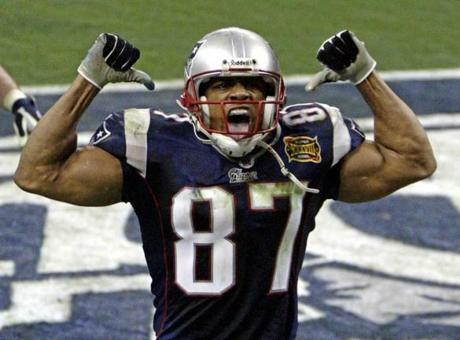 David Givens took a pass from Tom Brady down to the 1-yard line late in the fourth quarter to set up a touchdown pass to Mike Vrabel. 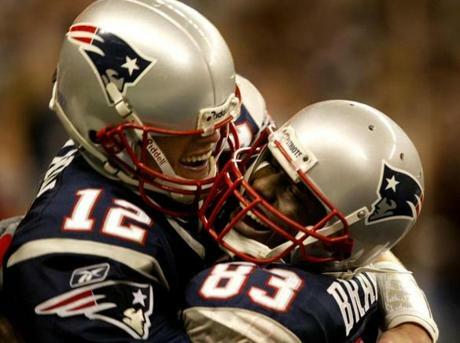 The scoring began in the second quarter when Deion Branch corralled a 5-yard touchdown pass from Brady. Brady won MVP honors for his performance, which included 32-of-48 passing for 354 yards and three touchdowns with one interception. Brady connected with Branch for a game-high 10 catches for 143 yards and a score. 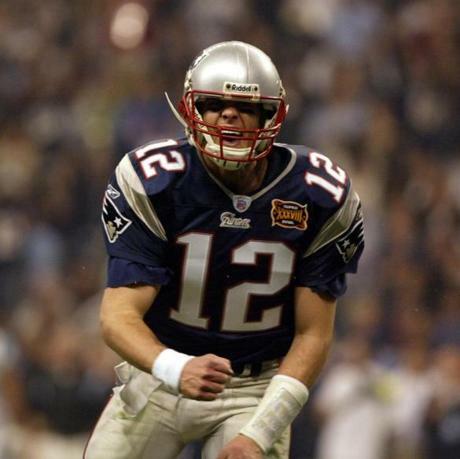 Brady led the Patriots to 481 total yards in a game that had seven lead changes. 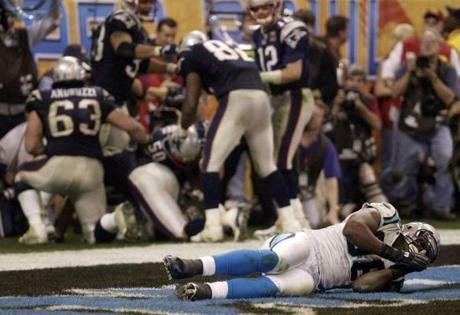 Harrison tackled Panthers tight end Jermaine Wiggins, who was with the Patriots when they won Super Bowl XXXVI two years earlier. Defender Matt Chatham celebrates a tackle against the Panthers. The game went in waves, with no points scored in the first and third quarters and 61 points scored in the second and fourth quarters combined. 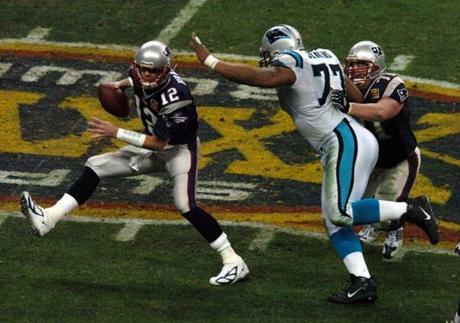 Brady, scrambling away from Panthers defensive lineman Kris Jenkins, had to evade considerable pressure from the Carolina defense. 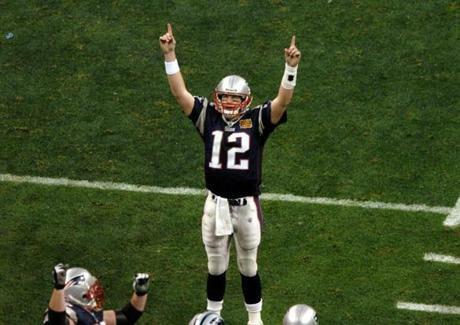 Brady, celebrating a touchdown pass, had an answer seemingly for every attack the Panthers put forth. 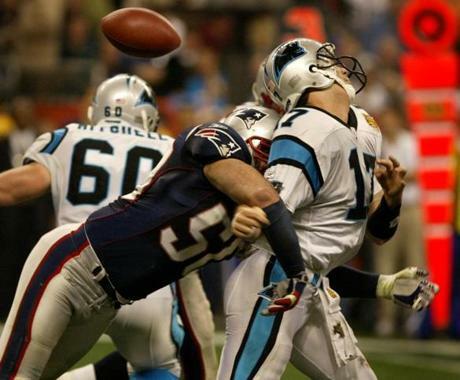 Vrabel knocked the ball out of the hand of Panthers quarterback Jake Delhomme. 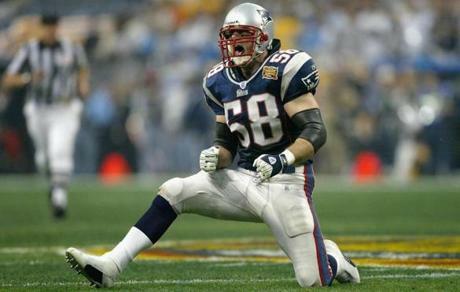 The hit forced a fumble that was recovered by New England. Givens went high to haul in this touchdown pass from Brady in the second quarter. The score was one of five catches in the game for Givens. Wiggins leaped over defensive back Eugene Wilson for a Panthers first down in the third quarter. Brady, evading pressure from Brentson Buckner, spread his 32 passes around to six different receivers. This catch by Branch set up the Patriots' second touchdown in the second quarter that they used to secure a 14-10 lead at halftime. 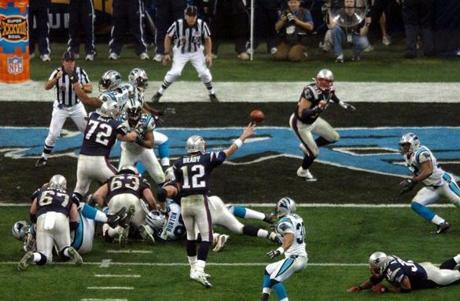 After Carolina took a 22-21 lead, Brady found Vrabel wide open in the end zone for a touchdown with less than three minutes to play. 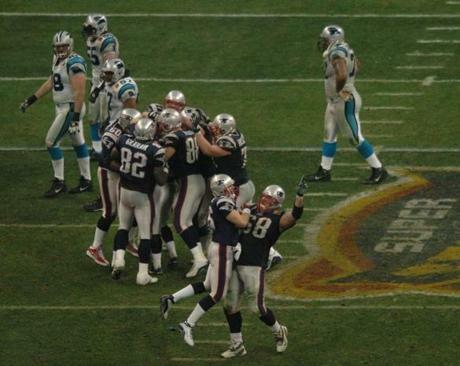 A short celebration by the Patriots, adjacent to the frustration of Panthers defensive end Al Wallace, was followed by a Kevin Faulk run for a two-point conversion. 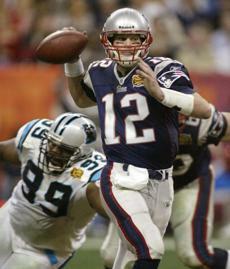 The Patriots still needed more, however, after the Panthers tied the game at 29-29. With just seconds to go in the game, tackle Tom Ashworth lifted up teammate Brian Kinchen to celebrate driving into field-goal position. 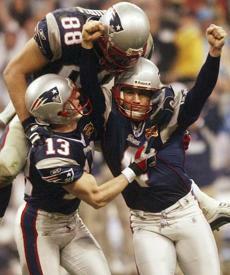 Adam Vinatieri drilled a 41-yard field goal with four seconds left to clinch the 32-29 victory. 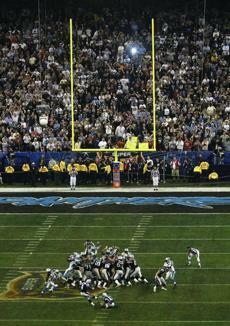 It was the second time in three seasons that Vinatieri had won a Super Bowl with a field goal in the final seconds. 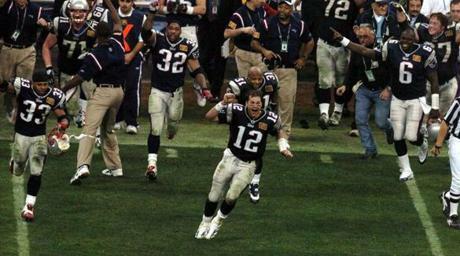 A jubilant Brady ran onto the field after the final horn after joining an elite club of quarterbacks with multiple Super Bowl victories. 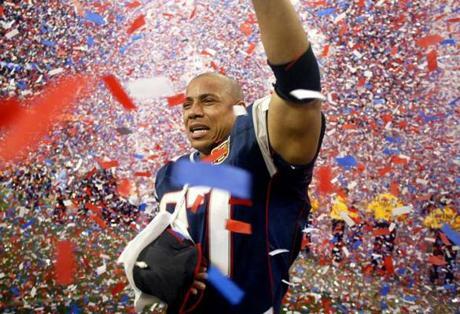 Harrison, who suffered an arm injury late in the game, earned a Super Bowl ring in his first season with the Patriots after joining the club as a free agent. 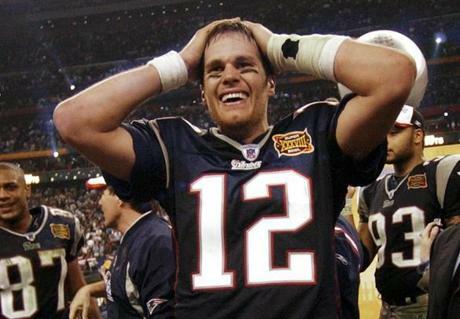 Brady and the Patriots went 14-2 in the regular season and finished the Super Bowl with 15 consecutive wins. 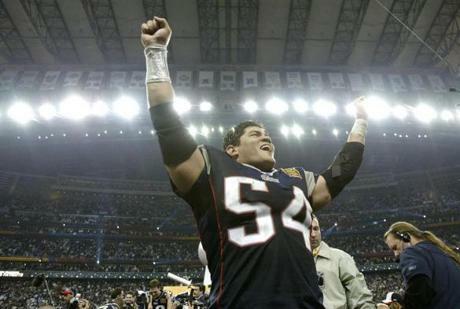 For veteran linebacker Tedy Bruschi, it was the second Super Bowl win in three tries, as he was a hold-over member of the Patriots who appeared in Super Bowl XXXI. 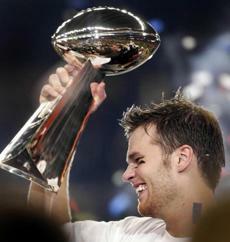 Just 26, Brady found himself on the podium with the commissioner for the second time in his four-year career. Back in Boston, thousands of Patriots fans celebrated in the streets around Faneuil Hall after the Super Bowl win. 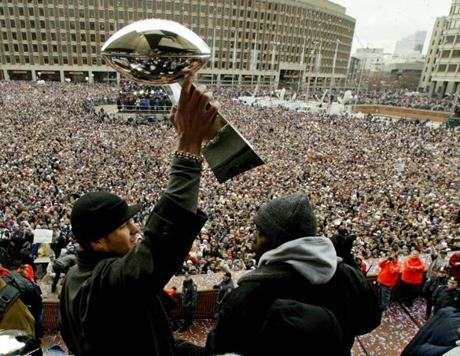 Two days after the game, Brady got to show off two Lombardi trophies to tens of thousands of fans who flocked to City Hall Plaza to celebrate with the Patriots.